Use a Rocker headphone splitter and enjoy music with your friends or anyone else, have multiple headphones connected together and enjoy without dropping any audio quality. Share Games and watching movies or videos this gadget us an ideal to use whenever with your friend or mate. 2.25 inches long x 1 inch wide, Works with any standard 3.5 audio jack. 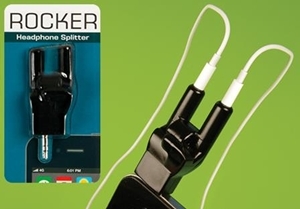 And the Rocker Headphone splitter is available at perpetualkid in just $11.49.